That is hopeful, but it does not promise immediate satisfaction. And so Peterson reflects on the role of pastoral ministry in guiding struggling Christians through what has been called such ‘dark nights’ of the soul. The counsel he gives pastors is applicable to all Christians as we come alongside of others who are struggling. Too often all we know to offer those struggling spiritually are trite and simple “fixes” to their struggle of doubt and loneliness. Rather what they may need are friends comfortable with walking with them through the valley of the shadow doubt and even death. They need friends who understand that such spiritual struggles are not abnormal and cannot be rushed. Peterson’s words are not only wise and refreshing, but counterintuitive in our technocratic age. It is good for us to hear them. 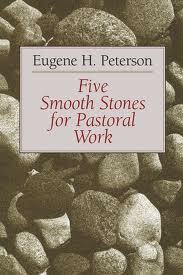 “Pastoral work acknowledges the difficulty and the pain of the quest and shares it. It does not attribute the agony of longing to a neurosis, it does not search for a cause in moral deficiency, it does not try to ‘cure’ it by working for an adaptive adjustment to ‘reality.’ It honors the quest. The difficult painful moments of unfulfilled longing are integral to the nature of the relationships. Enlightening, touching, and encouraging. I’m still amazed at the timing of God. Thank YOU for walking me through the shadow of doubt recently. I’m forever grateful for the impact you’ve had on my spiritual walk.